March 27, 2019 – Vancouver: The Downtown Eastside Women’s Centre (DEWC) is releasing Red Women Rising: Indigenous Women Survivors in Vancouver’s Downtown Eastside on Wednesday April 3 at 10:30 am at a press conference in the UBCIC boardroom, 3rd floor of 312 Main Street. This comprehensive and unprecedented report is the culmination of a participatory process with 113 Indigenous women and 15 non-Indigenous women in the Downtown Eastside regarding the National Inquiry into Missing and Murdered Indigenous Women and Girls. DEWC is a party with standing in Parts II and III of the Inquiry. 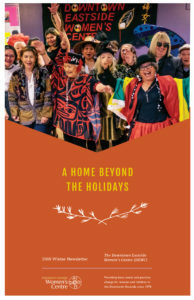 In a neighbourhood known as ground zero for violence against Indigenous women and girls, Red Women Rising: Indigenous Women Survivors in Vancouver’s Downtown Eastside is an extraordinary 220-page report with Indigenous women detailing compelling stories alongside rigorous research and holistic recommendations. “This report must not collect dust on a shelf. The brave work done by 128 grassroots women must be acted upon with urgency. We call on all levels of government to immediately implement the 35 key recommendations to end all gendered colonial violence against Indigenous women, girls, trans and two spirit people,” states report co-author Harsha Walia.